Samsung creates the world's first 85in bendy TV | What Hi-Fi? We're expecting quite a few 'world firsts' at CES this week, but Samsung set the ball rolling by unveiling its first 'bendy' TV in the spectacular surroundings of the Bellagio hotel in Las Vegas. Given that it's an 85in screen, we had visions of a very burly man holding an extremely large TV in his hands and flexing the screen for our amusement. Except it didn't quite happen like that. Rather, the screen in question had a small motor fitted at the back which pushed the edges of the screen in and out for the amusement of the assembled throng of journalists. So you can go from having a completely flat screen to one with a slight curve to it, all at the touch of a button. Samsung wouldn't say if it's destined for production, but it certainly made a good talking point. 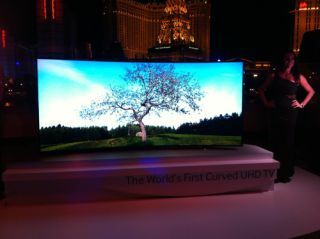 What is destined for production is the forthcoming UE9000 series of curved LED (not OLED) Ultra HD 4K screens. Unveiled with great ceremony was the flagship 105in model (above), alongside 'smaller' 78in, 65in and 55in versions (shown below). They'll all get a UHD Evolution Kit so they can easily be upgraded if the 4K spec changes, come fitted with a Quad Core Plus processor and, in the US at least, will include a UHD Video Pack with pre-loaded 4K film content from 20th Century Fox and Paramount. More Samsung news to come from the CES 2014 press conference.